For some reason or another, I always discover geeky material a while after release. 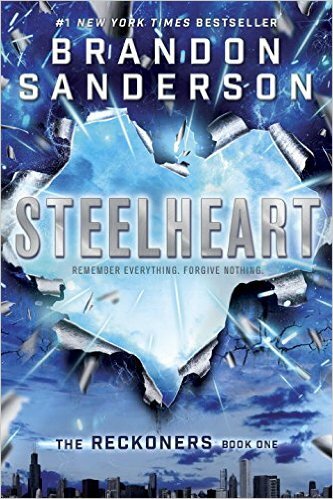 This has been the case for television hits such as Agents of SHIELD, and it was the case for the subject of this review: Steelheart by Brandon Sanderson, the first novel in his The Reckoners series, published in 2013. My immediate reaction to finishing this book was squealing and babbling about how magnificent it was. Any point I had free time in my day, I pulled out the book and read a chapter or two in between college classes. Steelheart is a perfect read for any superhero fans like myself. Think of this novel as similar to X-Men, but unfortunately Charles Xavier and his superhuman heroes are nonexistent. In Steelheart, the mutants are called Epics and the explanation for them gaining their powers is the rise of Calamity, a star that rose over the planet Earth—once Calamity was seen in the night sky, some humans had powers. Unfortunately, unlike in X-Men, most who were given powers used them to torture innocent civilians and rule as the leaders of the world. Reckoners are ordinary human beings who battle the Epics by learning their abilities and understanding their weaknesses. The central character, David Charleston, has struggled with Epics for his entire life after witnessing the brutal murder of his father by Steelheart, an Epic made entirely of steel. David eventually races to the Reckoners and aids their fight against these monstrous individuals. As a side note, it’s worth mentioning how artistic the cover is. “Don’t judge a book by its cover” is a quote that was repeated often at my house growing up, but it’s hard not to here. This cover, seen above, is really detailed with the silver outlining representing the steel from Steelheart’s abilities. The blue lightning overlooking the city demonstrates how the city is tied to the epics. The cover itself says a lot about the book in a very simple way. Sanderson formulates various characters with different personalities. I genuinely enjoy every single character introduced in this novel, which is rare for me. David is very brave and intelligent as he devotes his life to uncovering their weaknesses. The Reckoners’ team includes supporting characters such as Megan, Tia, Abraham, Prof, and Cody, each of whom is likable and has their little quirks that add humor to the story. Tia’s Coca-Cola addiction and Cody’s Scottish accent are just examples. The Epics are also crucial characters that you love to hate: David combats Steelheart, but also another Epic called Nightwielder, who creates objects with shadows which he uses to intimidate and annihilate civilians. The Epics are characters you fear but want to read more about. Steelheart has a variety of twists and turns that are not easily predictable. The end reveals so much about the Reckoners and the Epics that it actually made my jaw drop and led me to re-read a number of pages. I had a variety of those moments that when my roommate walked in on me reading, she just laughed at my reaction. Still, the secrets that are told at the end were shocking. This novel had been out for two years before I read its pages and dived into the story. On a positive note, at least I don’t have to wait painstakingly for the sequel, since it was released this year. 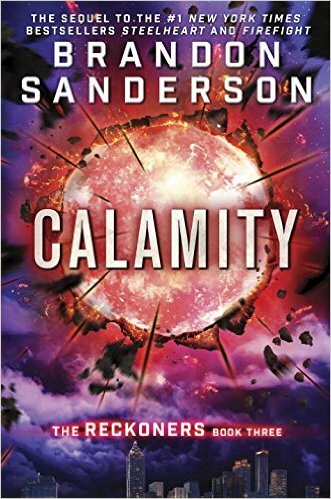 Expect another book review about Firefight, because if the sequel is like the original, it will be a fast-paced and action-packed book that I will finish in a matter of hours—and the third book, Calamity, is coming in April 2016.